The Rare and Deadly Vampire Walrus! Cartoonist Bob Canada turns us on the Vampire Walrus, horrific scourge of the arctic. His posting is as amusing as this drawing. Beware the vampire walrus! The Vampire Walrus’ wings are mostly for show, as they are far too small to lift its impressive bulk off the ground. Bob’s a designer and cartoonist from Indiana. Not Canada. I like his drawing style. I like the fact that he posts sketches along with the final art – I always like the energy contained in an artists sketches, sometimes more than the final. In my quest to cover all things Walrus, I give you a cartoon walrus I do not approve of, on a show I don’t like much either. Ironically, this episode is one of the only entire episodes of “The Penguins of Madagascar” that I’ve seen. So allow me to introduce you to Rhonda the Walrus. The episode description should cover why I don’t particularly care for this character. Marlene is getting a new roommate. Before her roommate arrives, she dances with Skipper with excitement, but Skipper is paranoid that Marlene’s roommate may be a spy, possibly with the intent of stealing Kowalski’s newest invention, a device whose function is not yet known, even by Kowalski. The penguins point out to Marlene that the new arrival weighs at least 1,500 pounds, enormously heavier than she is, and suggest that multitudes of otters might be on the way. The new roommate turns out to be a walrus named Rhonda, who is sloppy, has bad manners, bullies Marlene, and uses her as a live tissue. She also farts in the water constantly as well as in Marlene’s home. After faking her approval to the penguins several times, Marlene finally asks them to ship Rhonda somewhere else. But when she learns that a labeling error resulted in Rhonda being headed for a polar bear reserve in Alaska, her guilty conscience causes her to save the annoying roommate. At the docks, Marlene grabs onto a rope and uses Kowalski’s invention, which turns out to be a plasma cutter, to free the crate at the dock where Rhonda is being shipped out of. Once the crate returns to the zoo, Marlene and the penguins arrange for Rhonda to be transferred to the Hoboken Aquarium. Rhonda ends up being a spy after all, and she steals Kowalski’s plasma cutter and discusses it with Dr. Blowhole, Skipper’s unseen dolphin arch-enemy, en route to a new aquarium. Rhonda’s the type of character you come up with when you use the word “walrus” as an insult. 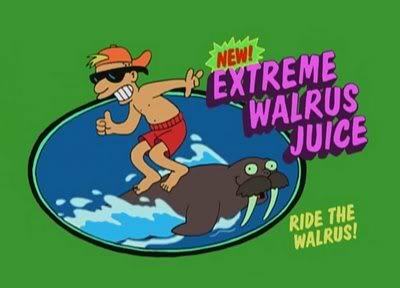 And let me close this out with one note to Dreamworks: Rhonda is a FEMALE walrus. WHY does she have TUSKS? Rhonda is voiced by Kathy Kinney who was the overly made-up loudmouth Mimi (a character I initially found refreshing) on the old Drew Carey show. 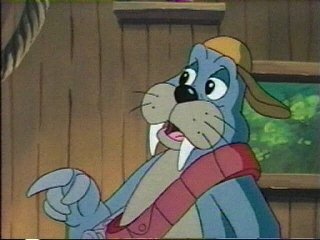 As part of my ongoing quest to make you readers aware of walruses in popular culture, I give you Rotor the Walrus, a character in the Sonic the Hedgehog cartoon series. I became aware of Rotor by accident, I’m too old to have watched the Sonic cartoons and never played the games, but my young son has been very into Sonic for some time. One night when I had half an eye on the TV, I noticed Rotor! So here he is. Not as well known as other popular cartoon walruses (like Chumley, which is the most popular search term that brings viewers to this site). Rotor is the mechanical genius of Sonic’s team of “freedom fighters”. He is self-described as a nerd, and this quote appears on his fanclub site (linked below). “If I spend my time working on this, I don’t have to face other people”, which I suppose is a very walrusy sentiment.